One of the most refreshing qualities of McMinnville and the Yamhill Valley is that our communities have not been exploited by tourism. Locals still outnumber visitors, and have worked hard to maintain a strong sense of community in the face of being “discovered” by the outside world. But just because we don’t have volumes of travel books written about us, doesn’t mean that you have to explore on your own. When you stay with 3rd Street Flats we provide you with a copy of the quintessential guidebook on Wine Country for use during your stay, but also with our own expertise to provide local insight into the best places to eat, drink, shop and explore in the area. 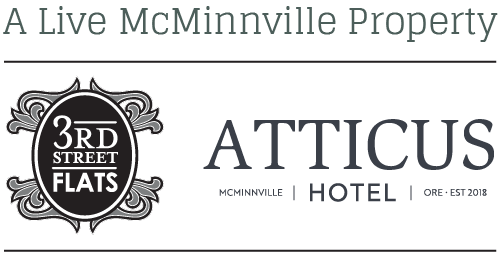 Feel free to email us in advance of your stay to get tips on planning your agenda, or check out Visit McMinnville for more help planning your stay. But to get you started dreaming about all the fun that’s just waiting to be had, here’s a sampling of a few of our favorite ways to play in the area. . . Spend a day experiencing the flavors of Historic Downtown McMinnville with the McMinnville Wine Walk passport program. With eighteen winemakers, three craft brewers, six fine dining options, numerous café’s and coffee shops, and a bevy of fabulous boutiques, who really needs anything more? Oregon’s Favorite Main Street has it all. And don’t miss seasonal events like the Farmers Market (which fills the street below 3rd Street Flats Historic McMinnville Bank location) during Thursdays in the summer, or the Art & Wine Walk, which is the third Saturday of the month all year. Take a horseback ride through the vineyards with Equestrian Wine Tours. Guide Jake Price (who seems like a character from the best book you’ve ever read) will take you on a two-hour tour through vineyards to several tasting rooms. Seeing a valley obsessed with organic farming and sustainable agriculture by horseback seems like a great way to go. Leave the car behind! Experience olive oil making at the Oregon Olive Mill. Oregon is becoming known for more than just fabulous wine and unforgettable food—we’re now producing wonder olive oil in the Yamhill Valley too. The Durant family, owners of Red Ridge Farms, an herb nursery worth a visit in its own right, planted olives in 2005 and are now producing their own oil at the Oregon Olive Mill. The taste is unmatched! Float above wine country in a hot air balloon with Vista Balloon Adventures. Based out of Newberg, Vista has years of experience giving folks a bird’s eye view of the valley. Relax and soak up the breath taking views of the rolling hills. Stand beneath the wings of the world’s largest airplane at the Evergreen Aviation & Space Museum. A world class museum located a mile from Downtown McMinnville, Evergreen is home to the Spruce Goose, a collection of other aircraft second only to the Smithsonian, a growing aerospace collection, an IMAX Theater and a world class water park. Tour the valley in style in a vintage Trolley. The beautifully refinished Trolley offers groups of up to 26 a great way to relax and enjoy the experience of wine tasting without anyone having to drive. And this is just the tip of the ice burg. There are beautiful small towns to explore, hundreds of vineyards to admire, galleries to peruse, and adventure waiting around every turn in the road!